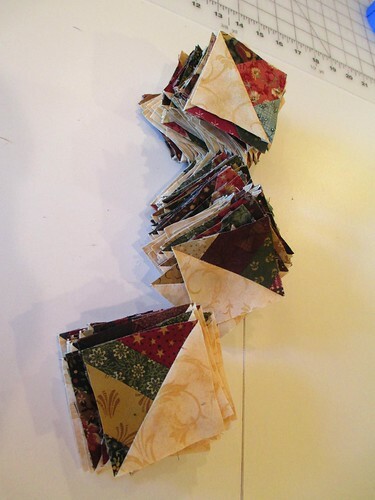 I had a gallon zip lock bag full of trimmings similar to this after I finished piecing my recent String Quilt top. I knew they were oddly shaped and I really should discard them, but you know how some of us just don’t want to throw anything away, especially after we have sewn it together. 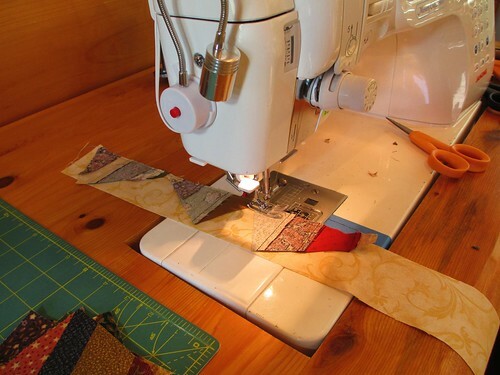 So, I decided to sew these little guys to a strip of neutral background fabric from my stash. 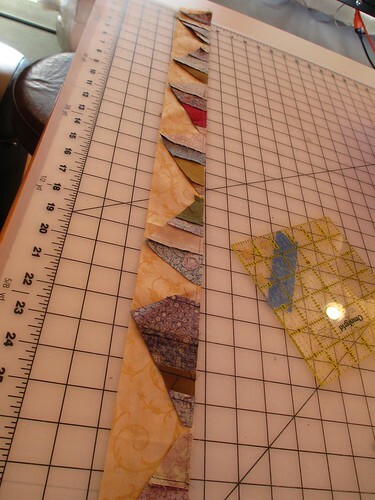 This background fabric is really scraps from the backing for a large quilt I long arm quilted. 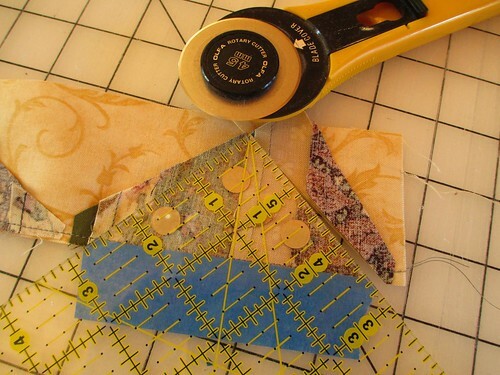 Then I marked a 6 inch rotary cutting ruler with blue painters’ tape so that I could easily trim a consistent half-square triangle. 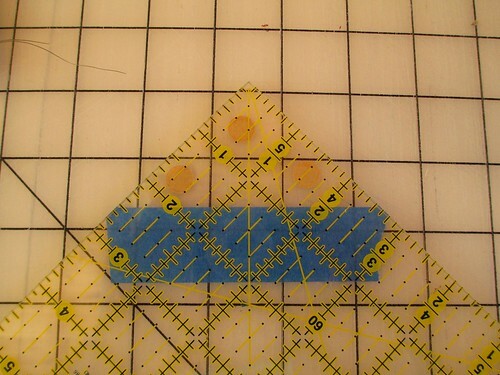 I found the ruler slipping on such a small, lumpy piece so I added 3 adhesive sandpaper dots to steady things up a bit. I pressed the units open toward the neutral background side. 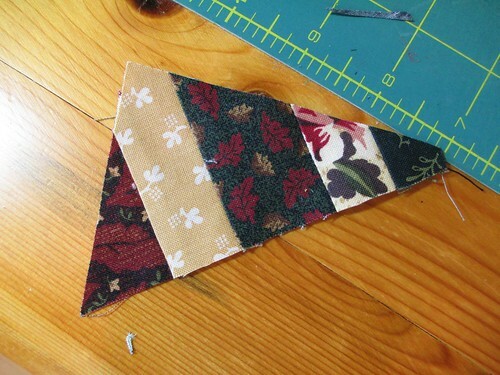 There were two tiny “dog ears” to trim off each resulting unit. These little guys started piling up! Actually, I had a design in mind that required 192 of the hst units, so I threw caution to the wind and made 200! 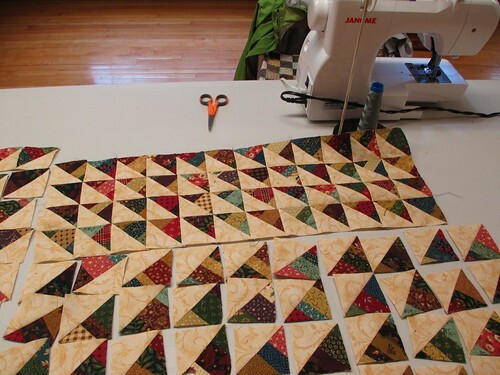 I took the hst’s to my Monday quilting group and arranged them on my work table. 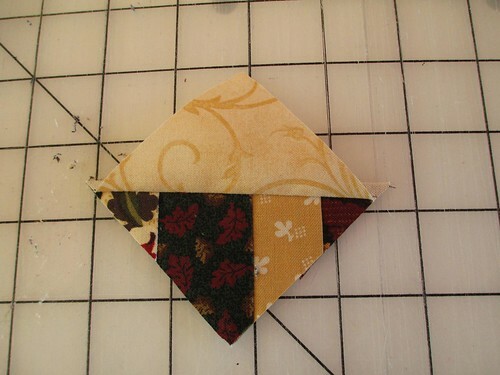 I sewed them together by quarters. 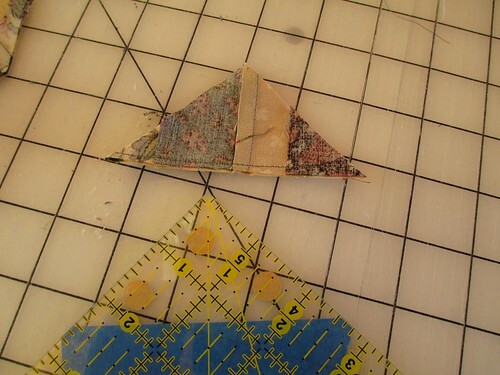 This shows how much the squares “shrink” from sewing them together with a 1/4 seam allowance. 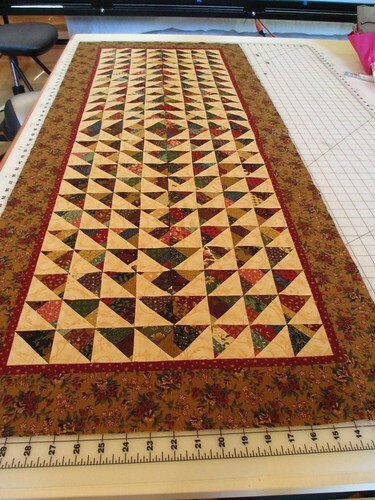 I sewed the quarters together, added a 1/2 inch inner red border and a darker 3 inch outer border. 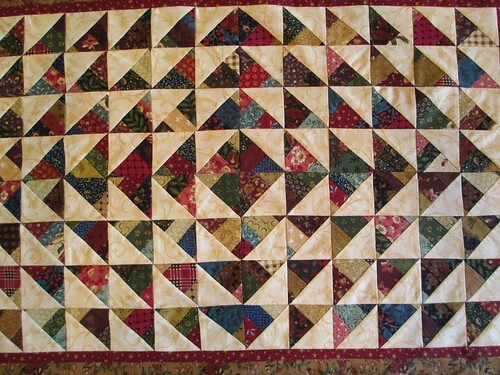 I especially like the way the center looks. 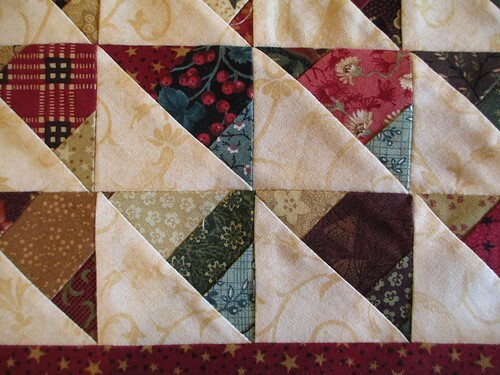 Pretty cool for something made of scraps from a string quilt! 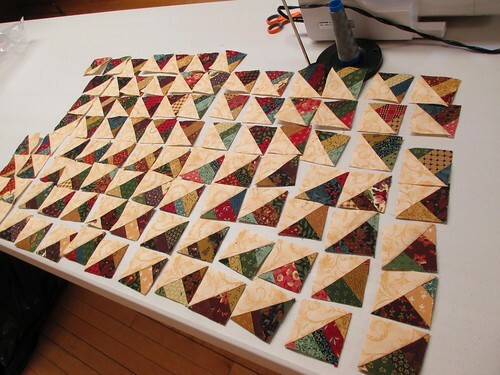 Cannot wait to get it on the long arm to quilt around all these precious little triangles! 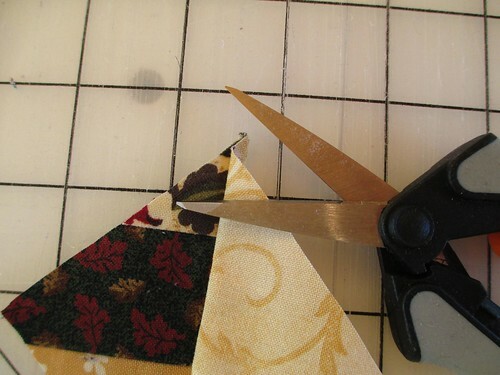 This entry was posted in Scrap String Table Runner, Uncategorized. Bookmark the permalink. Wow! It looks fantastic. 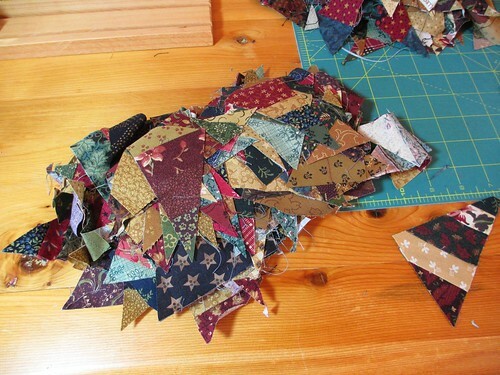 I do find it kind of satisfying to throw away all those little pieces as I work, but I am starting to reconsider that. This is very inspirational! THAT IS AMAZING ! ! ! ! Such a GREAT job. 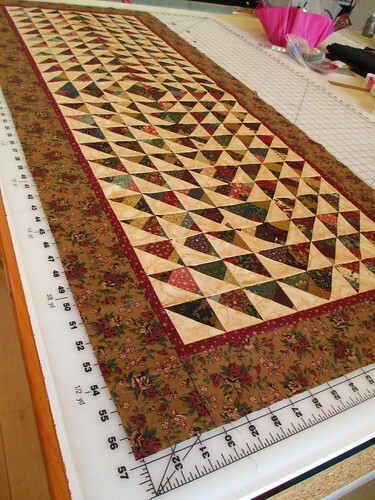 Can’t wait to see how you are going to quilt it and to see the finished runner. Beautiful ! ! ! !